Just came across this article from Recovering Journalist discussing A Vision for the Future of Newspapers — 20 Years Ago. I was taken aback by predictions at the conference about the next stage of the computer revolution. It was offered as an indisputable fact that the rate of technological advancement is actually increasing. […] packages of text, photos and film […] could be used to create customized news products at many different levels of sophistication. At the top end, such a product might contain the text (or spoken text) of a Post story on the big news of the day, accompanied by CNN’s live footage and/or Post photographers’ pictures, plus instantly available background on the story, its principal actors, earlier stories on the same subject, etc. All of this could be read on segments of a large, bright and easy-to-read screen (screens are also being improved at a great rate). […] A lot of them seemed to regard the content of new media as a given, or something that could be pulled off a shelf and dealt with like a commodity. […however, ] they are the products of talented reporters and, above all, editors who make informed choices for their readers and viewers. […] After this conference I am more convinced than ever that this is a key to our success. Our devoted customers like lots of things about The Post […m]ost important, they like the package much more than any of its elements. The same is true of Vanity Fair readers or 60 Minutes watchers. Successful media provide an experience, not just bits of information. 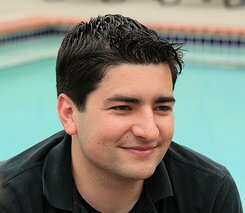 […] Confronted by the information glut of the modern world, I suspect even the computer-comfortable citizens of the 21st Century will still be eager to take advantage of reporters and editors who offer to sort through the glut intelligently and seek to make sense of it for them. Interestingly, when I asked a number of people at the conference what they’d like to be able to do in the electronic future, many spoke of finding all the extant journalism on subjects of interest to them. No one volunteered that he/she was eager to have access to the full transcript of Congressional hearings and debates, or the full screenplays of new movies, or the list of every transaction on yesterday’s NASDAQ. They all expressed a preference for processed information —- in other words, what we can provide. 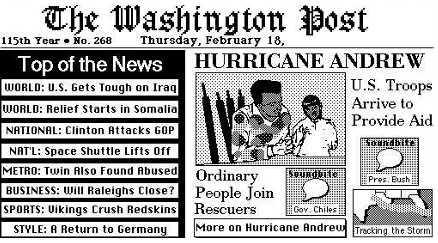 Take a look at this proposed Washington Post homepage from 1992. The primary source document is available as a PDF memo. It’s worth reading in its entirety.